AP CETs should be conducted through Online mode/ Computer based examination/ test from 2018-2019. In this connection, a committee has constituted for conduct Online AP CETs, Online mode Entrance Exams, Online mode entrance tests, Computer based entrance exams/tests notifications, Online applying procedure, syllabus, exam pattern, exam dates, hall tickets, results, rank cards, web based counseling dates, certificates verification schedule, web options and seat allotment details would be announced time to time by APSCHE and also available on APSCHE Web portal. 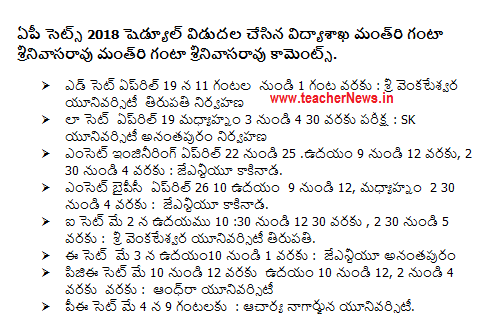 Notification of AP EAMCET , AP LAWCET/PGLCET, AP ECET, AP ICET, AP EdCET, AP PECET, AP PGECET, AP PG CET. 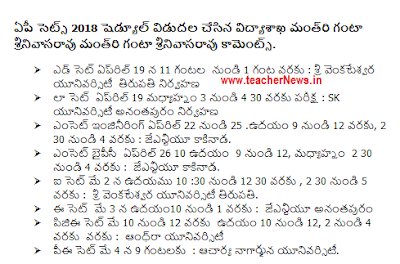 Online AP EAMCET 2018 Online AP LAWCET/PGLCET 2018, Online AP ECET 2018, Online AP ICET 2018, Online AP Ed.CET 2018, Online AP PECET 2018, Online AP PGECET 2018, Online AP PG CET 2018 and AP Common Entrance Test (CETS) and Board Exams Important dates.